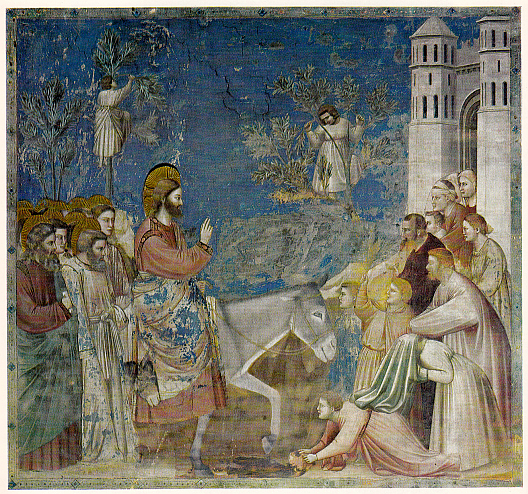 Painted between 1305 and 1306, Christ Entering Jerusalem is one of the many frescos painted by Giotto (ca.1266-1337) in the Arena Chapel in Padua. This painting exemplifies Giotto’s ability to make the viewer feel as if they were actually watching the event take place. He painted the scene of Christ arriving in Jerusalem, riding a donkey in the foreground at ‘eye’ level. The viewer’s eye is drawn to the lower half of the painting and the figures appear to be on the same level as those of us looking at them. In many ways the painting is simpler than what Giotto’s contemporaries were creating. We see the golden halos of all of the disciples but see only four of their faces and garments. Duccio, a contemporary of Giotto, in a work portraying the same event opted to paint all 12 faces making the work seem busier and also effectively decreases the focus on Christ. His work, also takes the approach of placing the viewer above the frame which clearly separates us to a watcher rather than a participant. Giotto effectively balances the height of the walls of Jerusalem with the white-clad figures climbing the trees to see the procession. To learn more about the artist and see additional examples of his work, please visit our Giotto Biography.